"I am excited to work with Mike Sisco on the 20 Minute IT Manager. We have created a product that is truly unique in the market. Each learning session contains valuable information that will actually help you on your job - while taking less than 20 minutes at a time. You could learn these lessons through trial and error but why should you? Let us use our years of experience to show you how to be a more effective IT manager today." "Improve your management skills and you will boost your career. I know because the mentors I've had literally accelerated my career by helping me become a much stronger manager - faster and easier. Tom and I have over 40 years of combined management experience and we can accelerate your skills development through the 20 Minute IT Manager mentoring series. Our approach is practical and straightforward - no theory, just proven processes and tools that will help you achieve more success." “The length of the topics (20 minutes) suits my learning style very well. Any longer and I begin to get distracted. I found the interface to be very usable and the replay function is great when I want to revisit a section. 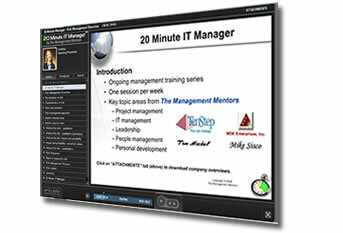 Click here to view an introduction to the 20 Minute IT Manager. “I like the tool and format, especially keeping it to 20 minute segments. You can always find 20 minutes for good advice. The material is right on target and moves at a fast pace. This is timely material that can set an IT manager above the competition and keep him/her focused on the important aspects of true IT management and strategic planning, and out of "react mode"